Our full list of FAQs is below, or search for your question. To find out all the latest information on Warwick Castle Resort including our restoration projects and Meet the Team pages, please visit here. Where can I find your UK Claims Notification information? We are no ordinary Castle. We are Britain’s ultimate castle - a place where history is brought to life through imaginative story-telling and unexpected discoveries. We are a Castle that doesn't do dull! For more information on job roles available and to apply please visit here. Unfortunately, work experience is not available at Warwick Castle Resort. However, we encourage people to apply for jobs once you receive your National Insurance Number. To apply for a position with us, please visit our recruitment page. Where can I learn about Warwick Castle Resort's History and Restoration projects? Our history reaches back almost 11 centuries. As custodians of the Castle we take our responsibility seriously - and have spent over £6,000,000 in the last 10 years alone on restoration. When you visit you are helping us keep the Castle alive, as well as supporting our continuing restoration programme. We shall endeavour to respond to your enquiry within 10 working days. We know that you may have some questions before or after visiting us so we’ve developed our Help Centre. Simply use the search bar at the top of the page to find the answers to our most frequently asked questions. If you would like to feedback on a visit or any part of your experience with Warwick Castle Resort, please click here to complete our Guest Feedback Form. If you need to reach out to us by phone, you can call us on 0871 265 2000. Calls cost 13p per minute plus your network providers access charge (please note these are significant if calling from a mobile telephone). If you are a school wanting to make a booking, please contact 0871 222 2272. Calls cost 13p per minute plus your network providers access charge (please note these are significant if calling from a mobile telephone). If you would like to feedback on a visit or any part of your experience with Warwick Castle, please click here to complete our Guest Contact Form. To help us investigate fully, please ensure you provide us with proof of visit such as tickets or receipts. If you have a press or marketing enquiry please use the contact below. For our Press Centre, please visit here. Please contact Cass Helstrip At White Tiger PR on 07968 255464 or email cass.helstrip@whitetigerpr.com. Alternatively, please email media.enquiries@warwick-castle.com. Please note: The above contacts are for Press/PR and Marketing purposes ONLY. The team are unable to deal with general enquiries. We value all customer feedback and are committed to providing a comprehensive and timely response to all queries. We endeavour to reply to each customer personally within 10 days, regardless of the method in which the original contact is made with us. At times we do receive exceptionally high volumes of customer communication and so in these instances, we ask for your patience and offer our assurance that we will respond to you as soon as we can. To ensure that we are able to investigate your feedback fully please contact us within 4 weeks of your visit. We regret that we are unable to assist with feedback after this time. Please ensure that you provide full contact details, and should you have a preferred method for us to contact you, please state this in your initial correspondence. Specifying the date of your visit and providing evidence of your visit such as a booking confirmation number, receipt or tickets will help us to look into your feedback as quickly as possible, and should your query be relating to items purchased here, receipts for these will also be necessary for us to investigate further. Being as comprehensive as you can in your initial communication will enable us to consider your feedback completely and provide a full response in the first instance. Please be aware that if you do not receive a response from us within two weeks of your request, then your request has been unsuccessful. We do, however, wish you well with your fundraising efforts. If you are aware that you have lost a particular item while you are at the Castle then please inform the attendant at our turnstiles and they will give you a lost property form to fill out. However, if you have noticed that you have lost an item after your visit then please contact customer.information@warwick-castle.com or call 01926 495421 with your details and a description of the item. Guests registered as disabled are welcome to buy any of our online tickets and are eligible to bring one helper free of charge. Visit our Warwick Castle Accessibility Guide for further details. Our aim is to provide you with information to assist with planning your visit to Warwick Castle to help you enjoy your visit. We recommend downloading a copy of the Accessibility leaflet below which has been created to help you navigate the Castle, grounds and facilities. Using this guide in conjunction with the Map of the Castle and Grounds will help to ensure you have an enjoyable visit to Warwick Castle. A copy of the Accessibility leaflet and map can also be collected upon your arrival. Warwick Castle was built as a mediaeval fortress and as such has a number of steps, narrow passageways and low doorways which can present a challenge to guests with reduced mobility. Should you require any further assistance during your visit, please speak to a member of the team who will be happy to help. There are a limited number of disabled parking bays available on a first come first served basis, subject to availability, in both the Stratford Road and Stables car parks. Parking charges apply. Please ensure a Blue Badge is clearly displayed at all times. Guests without a Blue Badge can request to use the Drop-Off Area in Stratford Road car park. Please note this is a coach turning bay so please ensure this area is on used to drop-off and pick up guests with limited mobility. Please speak to a member of the car park team if you need any further assistance. A: Assistance dogs are welcome to accompany guests throughout the Castle and grounds with the exception of the Towers & Ramparts. The Gaol, Princess Tower, Castle Dungeon and Time Tower attractions all include stairs and can be dark so this access in these areas are at the choice of the owner. Assistance Dogs must not be left unattended. Induction loops are located at all indoor trading units and the Ticket offices. Please look for the Induction Loop sign on display or speak to a member of the team for further assistance. What is the address for Warwick Castle Resort? Get full details and travel directions from our Travel & Directions page. Where is Warwick Castle Resort located? Warwick Castle Resort lies at the heart of Britain's motorway network, with easy access from London and Birmingham. Situated in Warwickshire, the Midlands - a day out at Warwick Castle Resort is never far away. The Castle is well signposted, and less than two miles from junction 15 of the M40. Our address is: Warwick Castle, Warwick, Warwickshire, CV34 6AH (for standard parking). Warwick Castle Resort is served by Stagecoach Buss routes. For more information and to plan your journey please visit here. Travel on the Warwick Castle Express - Departing from London every Wednesday, Friday and Sunday, from April – November. Depart at 8.30am, relax on-board a luxury air-conditioned Golden Tours coach with free Wi-Fi and enjoy the journey. Packages include Castle entry. Birmingham International Airport is only a 40 minute drive. Parking is available for motorhomes in our Stratford Road car park only. No spaces for vehicles of this size are available in our Stables car park. Standard car park charges apply. The nearest Petrol Station is located less than a mile from Warwick Castle Resort on Stratford Road. Use our postcode CV34 6AH to locate further stations online. The App 'Around Me' has locations of petrol stations. We offer a number of different parking options. For more information please visit our Directions & Parking page. Whilst we do not have Audio Guides, many of our attractions include audio detailing the history of the castle and society such as our Royal Weekend Party. *Please note: We only have English Guidebooks available. We apologise for the inconvenience. We have our welfare room available. Please ask a member of staff for assistance with this. All Day Dining is included in our VIP Exclusive Package. For more information please visit here. Do you provide carrier bags? What Retail Shops are there at the Castle? How will you remember your journey through 1100 years of history? No matter what your taste, style or budget, we have gift shops and restaurants (remove this wording) filled to the turrets with treasures and treats. Stables shop is at the entrance/exit to the Castle. Courtyard shop is in the main central courtyard and Kingmaker shop is at the end of the Kingmaker attraction. Other retail outlets open seasonally. The main Stables gift shop is open until the advertised Castle close time. Other gift shops open subject to demand. This is something that we do not currently offer. See or download a map of Warwick Castle. There is a lot to see and do at Warwick Castle - plenty to keep you occupied for the whole day! Take a look at our What's On page to see everything that's happening on the day of your visit. If you're in planning a larger group trip then you should allow at least 4 hours for everyone to get a good feel of the Castle. There are baby changing facilities just before you enter the female toilets in the Stables Courtyard, the female toilets in the Conservatory and additional facilities are located in the male and female toilets next to the Undercroft restaurant and in the Mill and Engine House. The Undercroft also provides a private area for mothers to nurse their babies. The Coach House and the Undercroft restaurant have microwaves available for heating food and bottles. In the event that your child goes missing during your visit, please report this to any member of staff who will be able to assist. We have a designated Lost Child Point, located in the Central Courtyard. There isn’t a specific area for first aid at the Castle, however we do have a number of trained first aiders on site. If you are in need of a first aider on the day of your visit then please inform a member of staff who will ensure that we get a first aider to attend to you as soon as possible. If you ask our attendant on the turnstiles entrance they will be able to stamp your hand and this will enable re-entry later on in the day. Your ticket will not allow re-entry. Do you allow photography at the Castle? Guests are permitted to take photographs of the Castle and its exhibits throughout the course of their visit. Please note that photography is not permitted in the Castle Dungeon or the Princess Tower. Available in the Dungeon, Kingmaker and Princess Tower by using the latest in innovative technology, we create exclusive attraction photo mementos for you to purchase to look back at as a great memory of your visit. Are you allowed to smoke at the Castle? The majority of the Castle and grounds are non smoking. However, we have one designated smoking area on the main Castle site, which is on the East Front at the top of the mill entrance steps and one designated smoking area at Knight’s Village. The same policy applies to guests using electronic cigarettes. Do you allow pets at the Castle? We do not allow pets on site at the Castle, the only exception to this are assistance dogs. We do provide locker facilities at the Castle. These are suitable for hand luggage sized cases and rucksacks and are situated in the Stables Car Park. The lockers cost £1 per use and the charge is non-refundable. Please speak with staff at either of our restaurants who will be able to advise you on suitability of specific menu items. Alcohol can be purchased from The Coach House Restuarant. Vegetarian options are available in The Undercroft Restaurant as part of their Pizza and Pasta service. Visitors are welcome to bring their own picnics to the Castle, with 64 acres of beautiful grounds it is easy to find the perfect picnic spot. What is happening during May Half Term? This May Half term welcomes a fantastic live-action Jousting Show to delight and amaze guests of all ages! The show will run from 25th May - 2nd June and will return again in the Summer from 20th July - 1st September. The Falconer's Quest is the UK’s biggest Bird of Prey show. Search the skies overhead as free flying Birds of Prey take flight in an all action, dynamic display of aerial acrobatics. Join the Falconer on a quest for the finest birds in the land, all set in a stunning riverside location within the grounds of the castle. Keep an eye on our website here for updates! Is The Falconer's Quest an additional charge to my Entry Ticket? No - The Falconer's Quest is included in all tickets booked for visits during Easter and then every day from 6th April - 31st October 2019. What dates is The Falconer's Quest on? Can I hold a Private Event at Warwick Castle Resort? Hosting an event at Warwick Castle gives you access to our dedicated Event Managers and passionate chefs who are trained to the highest standards. All our dining packages can be tailored to suit your unique event requirements. Why not make your event even more memorable by taking advantage of our extensive list of enhancements? From Fighting Knights to our gallant Knight on horseback, Fire Breathing Jesters to Medieval Table Magicians, your company logo on the walls of the Castle to a fabulous fireworks display, we have lots of special touches for you to choose from. From Dungeon Lates to elegant balls, please visit here for information on all our our public evening events! Do you offer Medieval Banquets? Blending scary storytelling with wicked humour and manic theatrics, this gory production complete with terrifying treats and dreadful drinks is a strictly adults only affair. What Conference facilities do you offer? Our recently refurbished Georgian Coach House provides the perfect setting for a business meeting with a difference. Full and half day packages are available, allowing your delegates time to explore the Castle, all our attractions, shows and 64 acres of Capability Brown landscaped gardens. What type of Team Building packages do you offer? We offer a variety of exhilarating team building packages from state of the art tablet based team building, to authentic Medieval Knight School; featuring authentic sword skills and archery. All our packages can be booked on their own or combined to make an action packed full day out the office. Please visit here to download our Wedding Brochure. To enquire about Warwick Castle Resort's Wedding Packages, please fill in an enquiry form here. DRAGON SLAYER IS A CAPTIVATING, IMMERSIVE LIVE SHOW FOR THE WHOLE FAMILY! All set to the forgotten legend of ‘Guy of Warwick’ and his quest for the love of Princess Felice of Warwick Castle. For more information an to book, please visit here. What upcoming Events are there at Warwick Castle Resort? From Dungeon Lates to sumptuous Medieval Banquets, find out information on all the upcoming events here. What dates is Dragon Slayer on? Please note: Show times will vary dependent on the time of sunset. Please see above timings as a guide. The exact timing will be communicated via email prior to the show. What are the different packages available for Dragon Slayer? We also have Short Break packages available. What do I need to know for the Dragon Slayer event? Q: Do I need an evening ticket for Dragon Slayer if I already have a daytime entry ticket? A.Dragon Slayer packages are entirely separate to our daytime tickets and can only be booked online, in advance. Q: Will I need to leave the Castle if I am visiting in the day and then return later for the Dragon Slayer Event? A: Warwick Castle Resort will close at 5pm on Dragon Slayer dates however The Coach House will remain open for those who wish to stay until the opening of Dragon Slayer. Alternatively, you are welcome to leave Warwick Castle Resort and return in the evening for the event. Q: Is Dragon Slayer a seated event or standing? A: Dragon Slayer is a standing event and will include walking to different areas of the Grounds. Please note chairs, including camp chairs or stools are unable to be brought inside the grounds. Q: Can I use a 2 for 1 voucher for Dragon Slayer? A: No, unfortunately 2 for 1 vouchers are only valid for daytime tickets. Q: I have purchased the Show and Hog Roast ticket when does the Hog Roast start? A: Once the gates open for Show and Hog Roast ticket holders, you can get your Hog Roast from our Conservatory Tea House any time before 8pm. Q: I am an Annual Pass Holder, do I get a discount? A: Yes, Merlin Annual Pass Holders and Warwick Annual Pass Holders can get a 20% discount on the Bronze Package only. To activate this discount, enter 'dragonpassholder' in the Promotional Code booking tab. You must bring your Annual Pass with you as proof of ID, if you fail to present this you will not be permitted entry to the show. Q: Can I use my Merlin Employee Magic Pass for Dragon Slayer? A: No, employee passes can only be used for complimentary daytime admission. Q: Can my child visit Dragon Slayer without me? A: Children under the age of 16 must be accompanied by an adult over the age of 18. Q: How much is it to park? A: All Dragon Slayer packages include complimentary Car Parking. Q: Which gate do I use to enter? A: All gates will be clearly signposted on your visit. A: No, bringing your own food and drink is not permitted during Dragon Slayer. There will be a selection of catering units available for you to purchase refreshments during the evening. Q: Is there Disabled Access for Dragon Slayer? A: Yes, there are designated zones for our disabled guests. Please ask a member of the Warwick Castle team for directions. Q: Is Dragon Slayer suitable for everyone? A.Dragon Slayer is a live action show including smoke, real fire and strobe lighting and portrays dramatic fight scenes. The nature of the show will be crowded and noisy. Kindly note that packages are not refundable if you choose to leave the show at any time. Q: Can I book for a large group? A: If you wish to make a large booking for more than 15 people, please contact events@warwick-castle.com to discuss your requirements. Do you do anything for Children University members? Warwick Castle are delighted to be a learning destination and linked to the Warwickshire Children’s University. To continue your learning outside of the classroom and to be a part of this award winning scheme, join us at Warwick Castle to earn credits to your learning passport by completing Warwick Castle’s Student Challenge. Complete the worksheet during your visit and hand it to a member of Staff at our Welcome Desk when you leave the Castle at the end of your day. If you have completed the worksheet correctly, we will stamp your passport with a special Warwick Castle stamp! Worksheets must be downloaded and printed in advance of a visit. They will not be available at Warwick Castle. Standard entry prices are applicable. Stamps given out at the time of a visit at our Welcome Desk / Turnstiles area by a member of Warwick Castle staff only. This area is located at the entrance / exit of the Castle. We are unable to accept posted forms - they must be handed in to Welcome Desk / Turnstile Area on the day of a visit. How can I make a School Trip Booking and what do School Bookings include? At Warwick Castle we aim to provide enriched and memorable experiences to everyone who visits us, whatever their age. Our experienced Education Team work hard to bring history to life, and our teaching experts are available on the day to deliver a full programme of education tours and workshops that are aligned with the national curriculum. Access into all attractions (excluding Castle Dungeons) and to all of our daily shows. Free coach / minibus parking. Free teacher planning tickets for two. Email education@warwick-castle.com to request a sample itinerary from our Education Team. Visit with 10 or more members as part of a Youth Group and enjoy great discounts and perks. For more information please visit Merlin for Groups homepage. If you are part of a youth group and would like to experience camping at Warwick Castle, please call 0116 232 4531 or email enquiries@youthfundays.co.uk. We are proud to offer free, downloadable resource packs to help with pre & post lesson plans. To view and download please visit here. If you require a VAT receipt, and you have already completed your visit to Warwick Castle Resort, complete a form here and a member of our support team will be in contact to complete this request. How much are tickets for School Trips? Prices for School Trips to Warwick Castle Resort vary throughout the year depending on the date of your visit. For full information on pricing for Schools Trips please visit here and select the "Pricing" tab. Join forces with friends and family, book as a group of 7 or more to save! For more information and to make a booking, please visit here. Where should groups go on arrival? Groups already in possession of pre-purchased tickets may go through the turnstiles on arrival. For larger groups we recommend that the group leader retains all tickets and does not hand them out to each member of the party, this will enable a more prompt entrance to the Castle. Groups without a reservation should purchase tickets from the ticket office or Group entrance (open in high season only) - group rates will be as the discounted walk up groups rate only. If you would like our Education Team to prepare you a sample itinerary for your visit to ensure you make the most of your day, please email education@warwick-castle.com once you have paid for your trip. Alternatively, please find our Teacher Pack here to assist with planning your visit and our School FAQ Guide. Can I pre-arrange Guidebooks for my group? Yes, you can add a Guidebook voucher to your basket when booking tickets for your group day out, simply select ADD MORE PRODUCTS when you have purchased your tickets. Can I pre-book lunches for our group trip? Yes - our Group Lunch options are a great enhancement to any visit. Group Lunches are served in the Georgian Coach House Restaurant - prices start at just £10.50 per person. We have both set menus and private dining options available. Also, if you are just visiting Warwick but not the Castle, then you can arrange a lunch in the Coach House without having to buy Castle tickets. Do you offer a School Loyalty Programme? Visit twice and get FREE Castle Entry tickets for your third visit! Warwick Castle is serious about providing schools with as much backing as possible, and so we are rewarding our regular visitors with a new loyalty scheme in 2018! It is paramount that pupils can continue to learn outside the classroom, and therefore we endeavour to inspire pupils and support teachers to make sure that the learning never stops! Collect you card at turnstiles upon arrival to the Castle to start stamping! Loyalty Card Terms and Conditions can be found here. I regularly bring large groups to Warwick Castle Resort - do you offer any further discount? Warwick Castle Resort offers a great day out for your clients whether you organise trips for either FIT’s or groups. Do you offer Educational Tours and/or Workshops for Schools? For more information on these packages, please visit here and select your class type (Primary or Secondary). To see how each package listed below meets the requirements of the national curriculum please click to view our Educational Programme. Throughout the year we aim to run a variety of Educational Events for Schools. To keep up to date on the latest Education Events please visit here. Does Warwick Castle Resort have SEND provisions for Schools? - We admit one to one carers into the Castle and Grounds free of charge. Ensuring your student feels fully supported by a person they trust throughout their visit. - Our Accessibility Guide explains specific attraction restrictions set by the manufacturer, so your students avoid any confusion on the day. For more information on accessibility at Warwick Castle Resort please visit here. Once you have confirmation of your paid booking, you can redeem your teacher planning tickets when taking your booking reference number, and School ID to our Box Office. These tickets cannot be booked in advance and are only redeemable at Warwick Castle Resort for Castle Entry only. Please note to take part in any of our educational tours or workshops we require a minimum of 10 students. Premium Merlin Annual Pass holders receive free entry to the Castle Dungeon, subject to availability. Please visit the Central Courtyard Ticket Tent to receive your timed entry ticket. Standard Merlin Annual Pass holders will need to purchase a Castle Dungeon ticket. Limited numbers of tickets are available to purchase from the Central Courtyard Ticket Tent, subject to availability. Secondary attractions at Warwick Castle Resort including, but not limited to, the Castle Dungeon will be subject to additional charges. How can I book a visit to Warwick Castle Resort with my VIP Merlin Annual Pass? What Golden Experience do you offer at Warwick Castle Resort? Discover the secrets and stories from over 1100 years of history, as you team up with an expert from our History Team to venture deep behind the scenes and explore areas of the Castle which remain closed to the public eye. 1 Gold Ticket Experience per person. All bookings must be made in advance with 7 days’ notice and should contact: MerlinVIP.WarwickCastle@merlinentertainments.biz and reference their unique code on the golden ticket. Tickets must be presented at each experience. A valid V.I.P. Experience ticket and valid V.I.P. 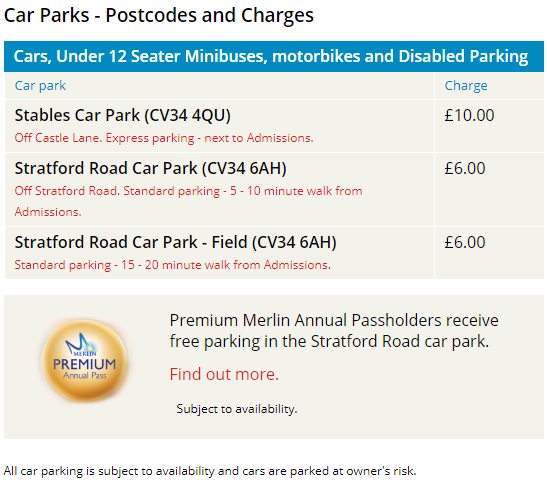 Merlin Annual Pass must be shown to gain entry to WARWICK CASTLE and/or any booked V.I.P. Experiences. Enjoyed your day? Keep hold of your tickets and you can upgrade them into an Annual Pass or Merlin Annual Pass, on the day of your visit ONLY. Please ask for a leaflet or visit Admissions for more details. If you have selected Warwick Castle as your "Home Attraction" (where you selected your passes to be collected from when making your purchase), please visit Admissions with your booking reference number and payment card. Please note the payment card holder must be present with their payment card to collect Merlin Annual Passes. If all pass holders are not present at the time of collection, passport style photos must be brought to the Annual Pass building for the passes to be issued. If you have not uploaded all pass holders photos when booking your Merlin Annual Pass/es online, you will be required to bring clear, colour head shot photo of each Pass holder in order for us to create the Pass/es. We are unable to use photos on smart phones or tablets. Please note: We are no longer in partnership with Nectar to redeem points for a Merlin Annual Pass. Annual Passes are perfect for families that want the freedom to visit at their leisure and invade the Castle grounds all year round! We offer 2 different types of Warwick Castle Annual Pass; Off-Peak and Peak. You can purchase the Warwick Castle Annual Pass at either the Individual or the Family rate. The family rate is for a minimum of 3 individuals, with a maximum of 3 individuals over the age of 12. Entry to Warwick Castle, Grounds and Gardens on weekdays and weekends during school term times. For a full list of T&C's, please see here. You can purchase a Warwick Castle Annual Pass online here. Online orders can be collected from Admissions on the day when you arrive. You can also purchase an Annual Pass from the Admissions desk at Warwick Castle when you visit. You can pick up your Warwick Castle Annual Pass the same day of purchase - please allow approximately 2 hours after purchasing before collecting. Alternatively you have up to 6 months to collect your Annual Pass. Please note, when collecting your Annual Pass you will be required to bring your payment card and booking reference number. Warwick Castle Annual Pass holders, whether Off Peak or Peak, do not get free entry into the Castle Dungeon. Limited numbers of tickets are available to purchase from the Central Courtyard Ticket Tent, subject to availability. Yes! Warwick Castle Annual Pass holders receive 50% off Castle tickets for Family & Friends. This offer is only available on the day against the walk up price at admissions and is for Castle entry only. Enjoyed your day? Keep hold of your tickets and you can upgrade them into an Annual Pass or a Merlin Annual Pass. You must do this before you leave at the end of the day, this cannot be done once you have left the Castle on the day of your visit. Please ask for a leaflet or visit Admissions for more details. The Warwick Castle Annual Pass will allow you access to Warwick Castle only, Britain's Ultimate Castle! A Merlin Annual Pass gives you access to Warwick Castle as well as a range of additional Merlin attractions. We unfortunately do not offer upgrades from Warwick Castle Annual Passes to Merlin Annual Passes if your Warwick Castle Passes are still valid. However, when your Warwick Castle Passes are coming up to expiry, you are welcome to renew them as Merlin Annual Passes and receive the Merlin Annual Pass renewal rate. For further information, please speak with our staff at admissions. I visited Warwick Castle recently and didn't know I could get an Annual Pass. Can I upgrade to an Annual Pass following my visit? What are the Warwick Castle Annual Pass terms and conditions? Warwick Castle Annual Pass terms and conditions can be downloaded here. As a result of ongoing weather damage, we are sorry to announce our Pageant Playground will remain closed for 2019. Whilst the playground will not be open this year, we have exciting plans to reopen this much-loved corner of the castle with an incredible new offering for families in 2020 so watch this space! Behind Warwick Castle’s mighty walls, lies the real heart of the Castle with the beautiful grand interiors. Marvel at the magnificent Great Hall, explore the lavish state rooms whilst also experiencing the tranquillity inside the Earl’s private Chapel. Ever wondered what a weekend spent in Victorian high society would be like? Join the Countess of Warwick and her royal guests for one of her lavish Weekend Parties. Warwick's Royal Weekend Party is included in all Warwick Castle Tickets! Explore the many towers and ramparts of Warwick Castle, with centuries of fascinating architecture and amazing views in all directions! The Towers & Ramparts are included in all Warwick Castle Tickets! The Kingmaker is included in all Warwick Castle Tickets! Enter the Time Tower & witness the birth of Warwick Castle, which once controlled the middle of England for over a thousand years. These ages have now passed along with their stories...until now. Join characters from the Castle's past as they travel through time on an adventure quest through Warwick Castle’s dark history of bloodshed, death, treachery & destruction and discover for yourselves the true story of 1,100 years of Warwick Castle through the Ages. Warwick Castle’s unknown story – told in full for the first time! Time Tower is an immersive audio visual multimedia experience capturing the essence of Warwick Castle’s rich and vibrant history! Suitable for all ages and included in all Warwick Castle tickets! Warwick Castle Resort's shows are a HUGE favourite of guests, young and old. Your ticket to Warwick Castle includes access to them all! From the firing of The Mighty Trebuchet to the awe-inspiring Bowman Show, our interactive Knight School for kids and, NEW for this year, The Falconer's Quest: The UK's Ultimate Birds of Prey show, there is something for everyone! For information on our shows including an option to select your visit date and find out what's on, please visit here. Knight School is our seasonal children's show were children under 12 can bring their sword* and head to the East Front to learn tactical defence skills with Warwick Castle's resident Knight! Knight School takes place during Peak periods (school holidays) and is included in all Castle entry tickets. For more information on our daily shows and activities, please visit here. *We have a small selection of wooden swords however these are subject to availability and therefore we recommend children bring their own toy swords. Once upon a time the brave Guy of Warwick went on a fearful quest to win the hand of the beautiful Felice. After falling foul of an evil sorcerer, it is now up to Felice to break the curse to free her sweetheart. Join the princess to help to solve the riddle which will reunite Guy and Felice to live happily ever after. Visits to the Princess Tower are included in all entry tickets subject to availability on a first come first served basis so make sure to collect your free Princess Tower timed ticket from the entrance to the Princess Tower. Visits to the Princess Tower are not available without a ticket. Please note: the Princess Tower is open every weekend and 30th March – 15th April, 26th May – 2nd June, 27th July – 2nd September. No more than 30 guests (adults + children) are allowed in the Princess Tower during each time slot due to capacity restrictions. Every person entering the Tower must have a corresponding ticket. There are several sets of stairs to climb to enter the Tower, so pushchairs should be left outside. Strictly no photography or mobile phone use is allowed in the tower. This is the largest working siege machine IN THE WORLD! The colossal catapult is an authentic recreation of one of the biggest and most deadly military machines of all time. The Trebuchet was the largest and most formidable of the siege machines and was, in essence, a huge catapult. The trebuchet was used to hurl huge projectiles to breach the castle walls. Large rocks and stones were the main ammunition but there is evidence of more unusual material. Manure and dead animals were also hurled by the machines into the besieged castle to spread disease! Pigs were often picked as the animal of choice as they were thought to be more aerodynamic! In this case, pigs most definitely could fly! For more information, please visit here. To see if the Trebuchet is firing when you visit, please visit here and enter your visit date. Choose your path through time to unravel history in the world’s first Horrible Histories adventure maze! *Please note: The Horrible Histories Maze is open all year round, however it may close in adverse weather conditions or due to low light levels. Does the Horrible Histories Maze cost extra? No, the Horrible Histories Maze is included in all official Warwick Castle tickets! Is the Horrible Histories Maze open all year round? Yes, the Horrible Histories Maze is open all year round, however it may close in adverse weather conditions or due to low light levels. Warwick Castle opens from 10am during the main season. Closing time varies depending on the date, and we always recommend you check the opening times for your chosen visit date. See our Opening Times page for full details. Warwick Castle Resort is Britain's Ultimate Castle, so it’s inevitable that there will be days when it is busy. However, with a bit of planning, you can still have the most amazing time! It can be difficult to say how busy the Castle will be on a day that you choose to visit, clearly school holidays and event periods are busier than mid week term time dates. To make the most of your visit on a busier day, arrive early, pre-book entry into The Castle Dungeon and our top tip is to download map of Warwick Castle to help you plan your day including our show times! If you have parked in the main car park (Stratford Road car park) you need to purchase a token before leaving site at the end of your visit. These can be purchased from the token machine at the entrance area. If you have parked in our Stables car park then a pay and display ticket should be purchased from the machine at time of parking. Complement your visit with a guidebook! Simply purchase your voucher by selecting it in our Webstore when purchasing your entry tickets and then swap this for your Guidebook on arrival at the Castle. Depending on what ticket you purchased, attractions included vary. For more information on our tickets and to book, please visit here. Yes! We offer a 2 Day Castle Ticket AND a 2 Day Castle Kingdom Ticket at a discounted rate online. To book please click Buy Tickets below. Allows a single visit to the castle any time within 12 months. Remember to print @ home for direct entry at the turnstiles! You will need to book a Dungeon time slot at the Ticket Office before you enter the Castle. Due to its scary content The Castle Dungeon may not be suitable for those under the age of 10 or those of a nervous disposition. Physically impaired disabled guests get the last 3 rooms for free due to the accessibility of the attraction. Online booking savings are based on gate ticket prices. All prices shown are subject to availability and can change at any time. This ticket cannot be used in conjunction with any other discount vouchers, offers or promotions. To book an Open Dated Ticket, please visit here. Enjoy a full day’s admission to Warwick Castle followed by a visit to the National SEA LIFE Centre in Birmingham with our exclusive joint ticket. Please note: Price includes admission to both Warwick Castle and SEA LIFE Birmingham. The Warwick Castle portion of this ticket is date specific. The SEA LIFE portion is open dated and will be valid for 3 months from the day of your visit to Warwick Castle. Anyone under 3 years of age doesn't require a ticket and will be admitted to the Castle free of charge! Only those aged 3 years and over require an entry ticket. If you purchased your tickets online and it rained for one hour or more during your visit, we will guarantee you a FREE return visit to the Castle, Grounds and Gardens. FREE return visit must be claimed within 60 days of your original ticket date. All you have to do is present your tickets from your first visit at the ticket office window/s within 60 days of your original ticket date and you will have another day out for FREE. For further terms and conditions, please visit the Rainy Day page. Senior tickets are available at the ticket office on the day for any guest aged 60 and over. Please note: Children aged 11 years and under must be accompanied by an adult aged 18 years and over. During school holidays and in the warmer months we have more shows and family entertainment available in the Castle grounds and this change is reflected in seasonal pricing. We GUARANTEE THE BEST PRICE on Warwick Castle tickets purchased online! We do not offer family discounted tickets for Warwick Castle Resort. Anyone aged 3 years and older requires an individual rate ticket. Children under 3 receive free admission and do not require a ticket. *For the purposes of vouchers, a secondary ticketed event refers to a concert, VIP Experience or date when tickets are not available at the standard gate price. Secondary attractions include, but aren't limited to, The Castle Dungeon. Generally, High Street vouchers can only be redeemed against 1 day entry tickets to the Warwick Castle Resort when producing the physical paper voucher at the Box Office. They cannot be used in conjunction with advance bookings online, Short Breaks, secondary attractions including, but not limited to, The Castle Dungeon or any other retail or food and beverage products. You can exchange your Tesco Clubcard point for 1 Day Entry Tickets into Warwick Resort. You will need to do this online through the Tesco Clubcard website. Unfortunately Nectar Points are not accepted for entry at Warwick Castle Resort. The Castle is privately owned and is not affiliated with National Trust properties. As a result of this members of the National Trust are not entitled to free entry. For the purposes of admission an adult is classed as 12 years and older. We do not accept entry into the Castle for children under 12 years old without an parent or guardian aged 18 years old or over. You may purchase tickets on the day of your visit from our Box Office, located at the entrance to Warwick Castle Resort. Most major credit cards are accepted. Please note purchasing tickets from our Box Office on the day will be subject to availability and can entail a wait during peak periods. Please note tickets purchased onsite on the day will be charged at the full walk up gate price - online discounts cannot be applied onsite. Our booking system will not allow any orders to be made on dates that your selected ticket type is not valid or is unavailable. Therefore, it will show as unavailable. You can collect your Warwick Castle entry tickets on arrival at the accommodation reception, you do not have to wait until the 3pm check-in time to collect them. If you have purchased your tickets from the Warwick Castle Resort website, you can look up your booking and re-print your tickets by using our Look Up link here. If you are completing your transaction online through the Warwick Castle website and having problems submitting your booking or payment, please make sure you check your bank account to see if any transactions have been processed. If you have been debited please visit here to check if a confirmed order has been processed. If you continue to experience problems, please make a note of any error codes and where in the booking journey you experienced problems. Complete a form here, with as much information regarding your attempted transaction and a member of our team will get back to you. If you have two booking confirmations and two different reference numbers, please complete a form here and a member of our team will investigate and contact you to resolve. This exciting 50 minute walk-through experience brings together live actors, shows and spectacular special effects that will send chills down your spine. The Castle Dungeon is a fully immersive, interactive experience that should only be visited by the bravest of people and those with the strongest stomachs. Therefore we recommend that this attraction is unsuitable for children under the age of 10 years old. The Castle Dungeon is not suitable for children under the age of 10 years old. Anyone under the age of 18 must be accompanied by a parent or guardian aged 18 years or older. Please note that babies in arms and any children under the age of 5 are not permitted to enter the attraction. Disabled guests (and carer) with physical impairment restricting mobility can experience the final four rooms free of charge, which are standard wheelchair accessible. Please speak to the team at the Castle Dungeon entrance for more information. Is the Castle Dungeon suitable for those with certain medical conditions? There is strobe lighting in the Castle Dungeon with the addition of extra lighting and special effects in the final room. Some areas of the Castle Dungeon include minor motion movements and smoke effects which may not be suitable for guests with back or lung conditions - if you would like any further information regarding this please speak to a member of staff prior to entering the Castle Dungeon. For obvious reasons the scary fun of The Castle Dungeon is not suitable for everyone. If you would like to visit the original Castle dungeon, this is at the base of Caesar’s Tower labelled as the ‘Gaol’, and is available to visit with a Castle only ticket. *Subject to availability. Price subject to change. Is the Castle Dungeon suitable for someone with Claustrophobia? The Castle Dungeon is not suitable for people with Claustrophobia due to the enclosed space, narrow pathways and small rooms. Due to the popularity of the attraction and the capacity of the dungeon, all tickets to the Castle Dungeon are timed, which you can book online or on the day. Please note your ticket entry time on arrival and arrive at least 10 minutes before your allotted time at the Castle Dungeon entrance. The Castle Dungeon is a walk through interactive attraction and lasts for 50 minutes, so please bear this in mind if meeting up with other friends or family throughout the day. Pssst. Booking your Dungeon slot in advance means you are more likely to get the time you want - it's a little hidden bonus for booking online! To pre-book your Castle + Dungeon Entry click "Buy Tickets" below. Please speak to a member of the team if you would like to end your Castle Dungeon experience. Please note, tickets are non-refundable and non-transferable. Is the Castle Dungeon suitable for pregnant women? Due to the scary and jumpy nature of this attraction, the Castle Dungeon is not suitable for pregnant ladies, people with heart conditions or those of a nervous disposition. The Gaol, the original dungeon, is a separate area included in all Warwick Castle tickets and can be accessed nearby at no additional fee. Please refer to the map of Warwick Castle for more information. What is the Code of Conduct for the Castle Dungeon?